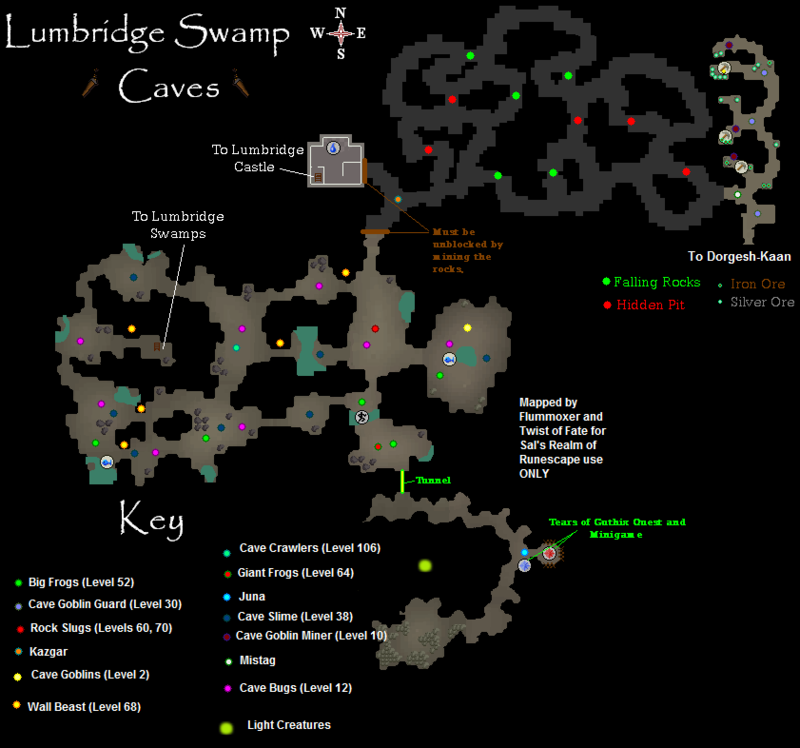 Beneath the stagnant swamps of Lumbridge are hidden caverns waiting to be explored, monsters waiting to be slayed, and experience waiting to be given! Take caution: Certain gear is required to kill some of these and many dangers lurk. Just before the entrance of the dungeon is a Candle Seller who will sell you candles for 1,000 gp each, as you will need some type of light source. You have a few options in getting here. Using the home teleport spell, you can teleport to Lumbridge, walk south past the church and cemetery and outside of town into the swamp. From there, follow the path southwest to the dungeon entrance. The Lumbridge city teleport at level 31 Magic can also work if you have the level and are willing to use 1 law, earth, and 3 air runes. Alternatively you can teleport to Draynor with the home teleport spell and run southeast until you reach the caves entrance. An Amulet of Glory has the option of teleporting you to Draynor Village. From there, walk east and a little south through the swamp, following the path until you reach the dungeon entrance. If you own either the Saradominist or the Zamorakian token that could be obtained during the Battle of Lumbridge, the First World Event, you can teleport to the remains of one of the god camps located north of the entrance to the caves. All Fairy Rings can take you to Zanaris. From that fairy ring, walk northeast in Zanaris toward the other fairy ring near the entrance. Use it, exit the shack, and walk west to the dungeon entrance. If you have started The Lost Tribe quest, you can enter through the hole in the basement of Lumbridge Castle. Use a rope with the Dark Hole to enter the caves (note you only need to use a rope with it once). If you wish to navigate the cave you will need a lightsource. The better the lightsource the more light it gives off and the less likely it will ignite the swamp gas. The swamp gas, if ignited, can explode and cause your character a lot of recurring damage which may even kill you. Candle: Candles are the worst form of light. They easily ignite the swamp gas, can become extinguished, and provide little light. You will need level 1 Firemaking to light a candle. Torch: Provides more light than a candle, lit at level 1 Firemaking, but has the same risks. Candle Lantern: Candle Lanterns are a step up from the basic candle. They provide a little more light and are less likely to ignite the swamp gas. Candle Lanterns require level 4 Firemaking to light. Oil Lamp: Oil lamps are an average form of the light. They are brighter than Candle Lanterns, but the open flame makes them more vulnerable to the swamp gas. Level 12 Firemaking is needed to light this lamp. Oil Lantern: Oil Lanterns are brighter than Oil Lamps and are less likely to cause an explosion. You will need level 26 Firemaking to like these. Bullseye Lantern: Bullseye Lanterns are the best type available. The light up the entire cave and very rarely, if ever, cause swamp gas explosions. 49 Firemaking is required to light these lanterns. Mining Helmet: Lit at level 65 Firemaking, will not go out if you fall in the water in this dungeon. Seer's Headband: A reward from completing any level of the Seers Village tasks. They also rarely, if ever, cause explosions. For more information on making lanterns, please visit our Crafting Guide. 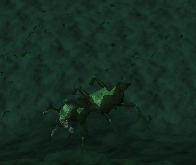 The Tears of Guthix Activity is a common reason many people visit the Lumbridge Swamp Caves. It can be played once a week and provides experience in your lowest skill, available after the Tears of Guthix quest. Follow the map to the south end of the caves and enter the tunnel. Pass the light creatures and walk down the stairs until you reach Juna. Tell her a story and enjoy your weekly experience! You must have gained 100,000 experience in total or 1 quest point in that past week to play. For more information about this Activity, please see the Tears of Guthix Activity guide. The cave also has several places to fish with a small net or fishing rod. All bait fish and small net fish can be caught here. 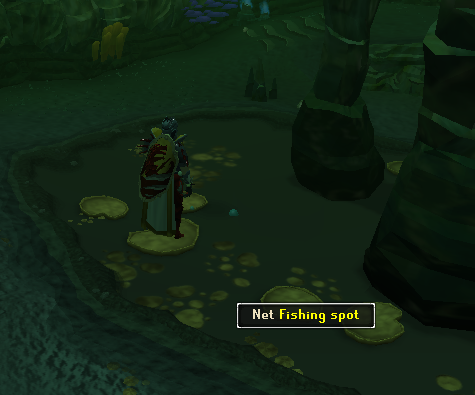 You can net fish for Frog spawn at level 33 Fishing, or Slimy Eels (Level 28 Fishing) and cave Eels (Level 38 Fishing). Eel fishing requires a Fishing rod and bait. The Dorgeshuun Mines are accessible after completing the Lost Tribe Quest. There are 9 iron rocks and 12 silver rocks here. 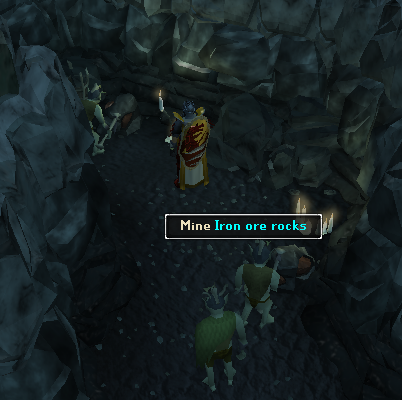 You can also sell your ores to Mistag for 13gp each iron ore and 60gp each silver ore. Near the Dorgeshuun Mines, you will find the entrance to Dorgesh-Kaan to the south. 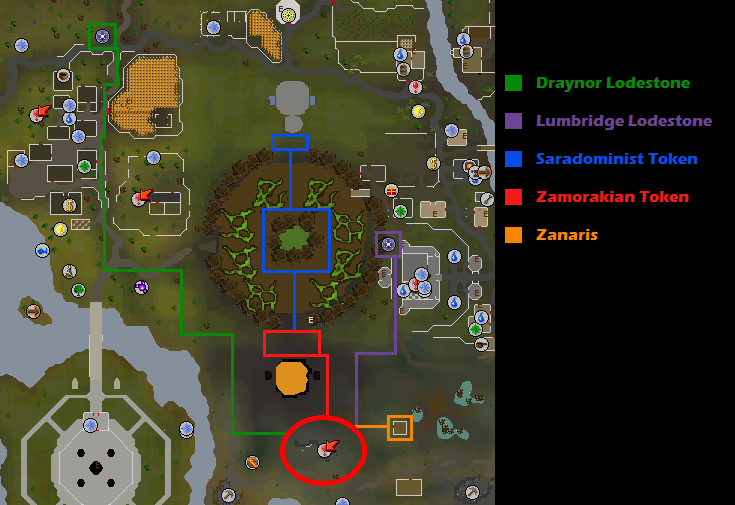 Kazgar is found just outside the Lumbridge Castle cellar and will lead you to the Dorgeshuun mines after you have completed the Lost Tribe quest so that you don't have to venture through the twisting caves. After the Death to the Dorgeshuun quest, he can also take you to the Lumbridge Watermill dungeon. 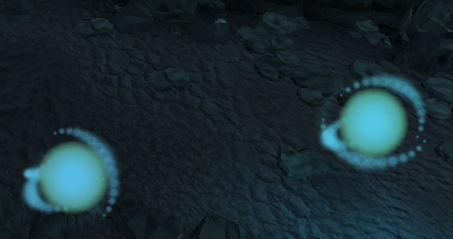 In the deepest and darkest regions of the cave toward Tears of Guthix, the mysterious light creatures thrive. They can not be killed and will ferry you to the other side of the chasm if you shine a lantern with a sapphire lens at them. Mistag is a friendly, one-armed Cave Goblin. He will buy ores off you, teach you some goblin history, and lead you back to the Lumbridge Castle cellar. Before the Lost Tribe quest, he is near the entrance to Lumbridge Castle cellar. 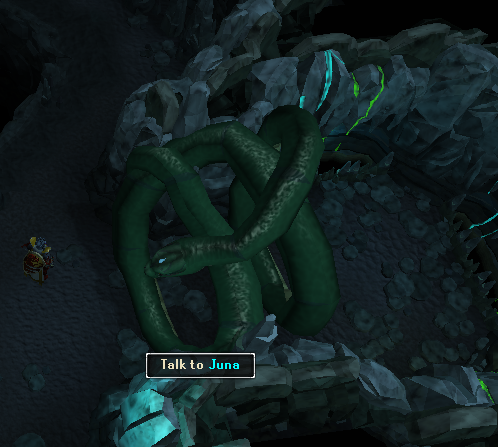 Juna is the guardian of the Tears of Guthix. 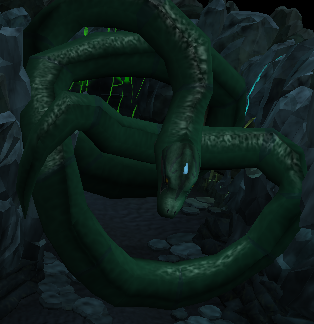 She is a snake that you must talk to to start the Tears of Guthix quest, and the one to talk to whenever you want to enter the Tears of Guthix chamber to gain your weekly experience. Wall Beasts are one of the first creatures you encounter. Wear your Spiny Helmet at all times because without it the Wall Beasts can inflict up to 440 damage on you. You need 35 Slayer to kill them and level 5 Defence is needed to wear the helmet. A Slayer Helmet for higher levels will provide the same protection. Spiked helmets also work. Cave bugs are one of the most abundant critters in the cave. They are weak yet still require 7 slayer to kill. They also regenerate their health at a fast rate. If you are a lower level, bring some food. These gelatinous blobs of slime are found through out the cavern and require 17 Slayer to kill. Remember to bring Antipoison potions if you are going to kill them. Their potent poison can hit up to 32 Life Points. Cave Crawlers crawl around the cave and only players with 10 Slayer can kill them. Like Cave Slime, these creatures are also very poisonous, so bring lots of Antipoison. Rock slugs have really hard shells. You need 20 Slayer and some bags of Rock Salt to finish them off once they reach low health. Big frogs hop around the cave, mainly to the south. They drop big frog legs, a popular Gnome delicacy. Several Giant frogs make their home in the Lumbridge Swamp Caves. They are fairly strong. Occasionally they drop Giant frog legs which can "feed a Gnome family for a week." The docile Cave Goblins are afraid of outsiders and don't put up much of a fight. They will be more willing to talk to you once you've done the Lost Tribe quest. The Cave Goblin guards protect the Cave Goblins from outsiders. They are fairly weak and drop bone spears and clubs. Cave Goblin miners mine the iron and silver rocks in the Dorgeshuun mines. They don't like combat and can drop Mining Helmets when killed.